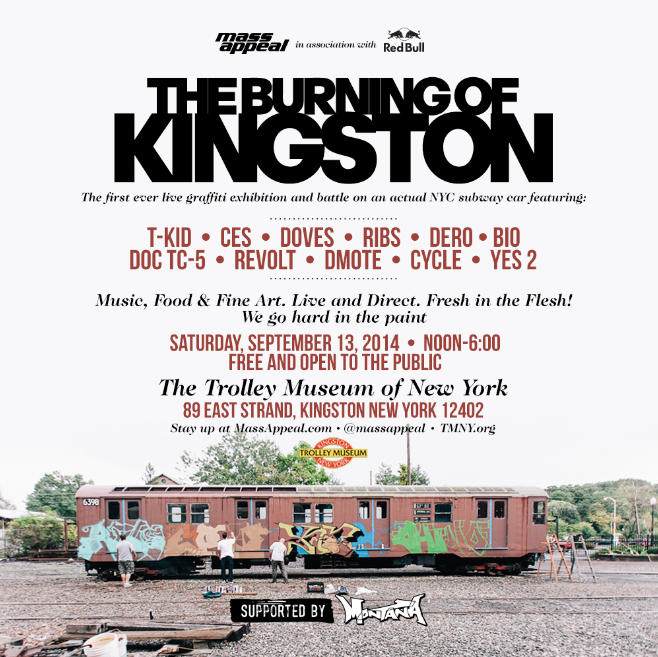 (New York, NY) Tuesday, August 26, 2014 – With a name inspired by an intense moment from the Revolutionary War as it happened in Kingston, New York (as the Red Coats marched out of Kingston in 1777, they burned much of the city down), Mass Appeal, with support from Red Bull, is hosting “The Burning of Kingston“ – a live graffiti exhibition and battle that will happen on the exterior of an authentic subway car. Taking place on September 13th at the Trolley Museum of New York in Kingston, eight insanely gifted graffiti artists will come together to battle for bragging rights and recognition inside of the rich culture of “writing” and beyond. Inside of writing culture, a “burner” is a superior work of art. What started out as friendly competition by New York City kids during a period when the city itself was on the verge of bankruptcy has now morphed into a global language and art form with many dialects worldwide.